Yoram Gross Film Studios. 1992. Director: Yoram Gross. Music: Guy Gross. CD (ST) ABC. 512 914-2. 1992. (Re-issued 1994 CD/CA 8143702/4). 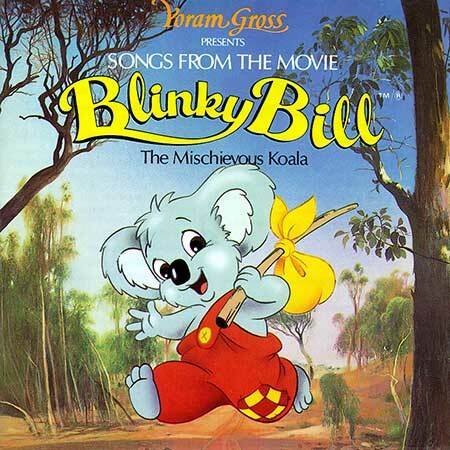 "BLINKY BILL - SONGS FROM THE MOVIE". All Music Composed and Produced by Guy Gross. Published by Mushroom Music. Lyrics by John Palmer except * Lyrics by Mattie Porges. All Songs Performed by Robyn Moore and Keith Scott except where indicated. Live Musicians: The Danglin’ Brothers. Narrative Dialogue by David and Carol Witt. Performed by Keith Scott. Recorded at Trackdown Studios, Sydney by Simon Leadley, Tim Ryan and Bernard O’Reilly. Executive Producer: Geoff Watson..
You And Me. * v: Robyn Dunn and Geoff Robertson. Backing vocals Kevin Bennett. I’m Old Man Wombo. v: Robyn Moore and Keith Scott. Gribbet. v: Ross Higgins and Guy Gross. Don’t Try To Sing Underwater. v: Guy Gross. Who’s On The Menu Tonight. Sleep, Bush Baby Sleep. v: Julie Anthony. CD(t)	(OP)	(See COMPILATIONS - LOTS AND LOTS OF GREAT MUSIC FOR KIDS: Tk14). CD(t)	(OP)	(See COMPILATIONS - MORE ABC FOR KIDS GREATEST HITS: Tk11). CD(t)	(OP)	(See COMPILATIONS - KIDS FAVOURITE TV & MOVIE THEMES: Tk3).